So, my girlfriend Jill has been bringing in this Trader Joe’s pre-packaged Butternut Squash & Creamed Spinach Gratin to work everyday. It is sooo delicious, however, it is not so healthy. So, I decided I needed to HEALTHIFY this delicious recipe so I could eat it guilt free! I am sooo happy with how this turned out! The whole family loved it! It is the perfect side dish! Hopefully it will get Jill approved too! Toss the butter nut squash cubes in the the coconut oil and place in a small casserole dish so that all the cubes fit in a single layer. Place in the oven for 20- 25 minutes mixing them halfway through. While that is cooking, saute the onion and garlic on a pan on medium heat with a little oil until onion becomes clear. Then mix in the spinach. Once the spinach begins to wilt add the greek yogurt, almond milk, and nutmeg. Allow that too cook for a minute. 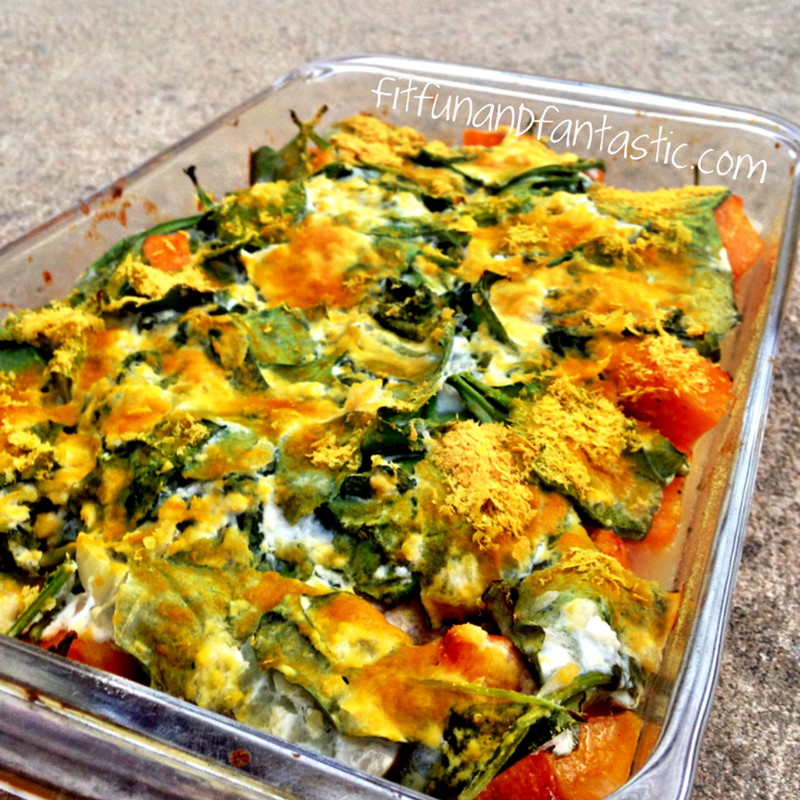 Once the 20 minutes is up take your butternut squash out of the oven and add the spinach layer so that it covers the entire top of the casserole dish. Then add nutritional yeast on top of the spinach layer. Don't have nutritional yeast? This would also be great with Parmesan! 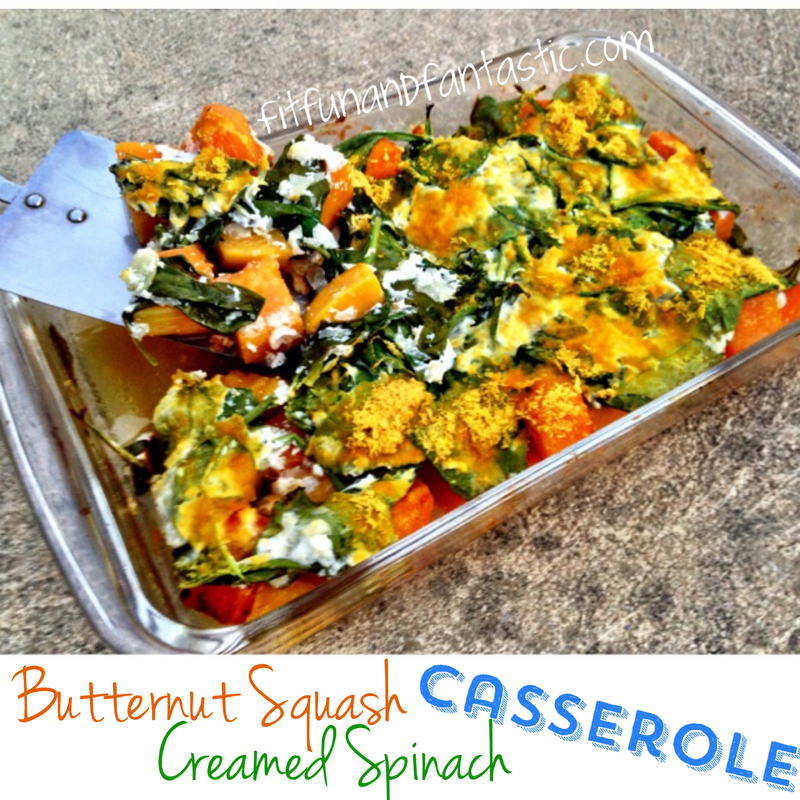 9 Responses to "Butternut Squash & “Creamed” Spinach Casserole"
Yum! This looks so good. I even have all the ingredients in the house. Made this tonight and it was really good!! The husband really liked it too! He kept saying how good it was :). Definitely a keeper. Thanks for the great recipe and can’t wait to try some of your others. Nutritional yeast is packed with nutrition, particularly B-vitamins, folic acid, selenium, zinc, and protein. It’s low in fat, gluten-free (check specific brands for certification), and contains no added sugars or preservatives. i use it for its flavor which is cheesy and nutty. The only substitution would be actual cheese, but then you are increasing calories and fat. Yay!!! I am so glad you tried it and loved it!